This comprehensive course contains 32 hours of continuing education content specially designed for electricians in California who are looking to compete a renewal of a license. This course has been approved by the California Department of Resources (DIR). This course takes a look at revisions that were made to the National Electric Code (NEC) for 2017. This segment discusses the 2017 revisions to Chapters 1, 2, 3, 4, 5, and 7 of the NEC. This course examines the topic of safety. This segment will address safety standards implemented by the Occupational Safety and Health Administration (OSHA). This course explores NFPA 70E which deals with arc-flash and the hazards of arc-flash. This course covers the related concepts of risk and liability. This course looks at how to market a business and increase sales . The course will examine professionalism and professional conduct as it relates to electricians. The course will discuss contracts. This segment will look at the contracts electricians will use as a part of their business activities. I really enjoy this course. At my own pace, which I like the most. That’s why I keep coming back. Very concise and to the point. Excellent. I think this was the most informative continuous education class I ever had. Good class, very professional and informative. Well done. Thank you! Glad I choose this course. The detailed review of the change from 2014 to 2017 were presented clearly and with lots of detail. This is critical and was done well in this course. The electrical industry business portion of this course was very useful. I think it was a great idea to teach the code sections with plan,build and use. It made following and finding the section you were looking for so much easier to find and too also understand why to look there. GOOD JOB !! I love your course. Very nicely detailed. You guys make the explanation understandable. Thank you!! This is the 3rd time I've used TradesmanCE for my 32 CEU's required for license renewal. Why? Because they're the best !!! found the 2017 NEC changes sections most valuable. It was great from the top to the bottom. It gave me what I needed. i really like the course because it gave me a lot of information I was not aware of. Very clear and direct pathway for successful completion of state required continuing education. I will continue to use Tradesman CE in the future. Thank you! Very good course, very helpful staff. Great Course! I am recommending! Course is fantastic! Great explanations of changes and updates. Very thorough. I like the explanation about why changes, exemptions, additions, has been done. It was very informative and great to do at my own pace. This course was generous to our time sensitive scheule. Contact Lisa for a fast track to sign ups, course navigation, interpretations, or billing. She is true professionalism and efficiency at every level. I enjoyed the "at your own pace" process. I like that the course was not just code but other relevant topics also. I like that I could complete the course at my own pace. Very informative, cost conscious, and up to date. Very easy. Love the go at your own pace aspect. Beyond user friendly! Look forward to coming back again in the near future. For some reason I guess I got the wrong course, I just needed for General Electrician Renewal certification. Does a good job of going over the major changes to the 2017 nec. Easy to follow along and pick back up when continuing. Excellent course! Gave all updates to the NEC in an easy format to study. Nice to learn about contractor rules and regulations too. Question 1&2 are referring to electrical license number, i am taking this course for my certification renewal, is this a problem. pretty informative on all levels from code to business. very convinience,informative,and easy to follow. Very Comprehensive, in depth code updates, emphasis on professionalism should be mandatory in everyone's courses. This course is of great value for all electricians wanting to keep abreast of the latest code changes. The only thing I would change is the lasts chapters, most of us don’t have use for them. Easy, short, sweet to the point. Good course i like it. Very informative. The courses are all informative and covers the updates well. I found the course material to be explained well and the site easy to navigate. Very informative and well formatted! convenient way to get the course completed. very informative, very flexible time schedule. Great job guys! Very informative. Excellent course, responsive course, worked on it while I could. Great Course, very informational. I liked the fact that I could go at my own pace. This course was super easy and painless. Two thumbs up. This is a straight forward and easy to use format. Filled with good information. The "at your own pace" learning and review is perfect for busy people. Hands down, I'm so glad I took this course. Thank you!! Very user friendly,easy to follow to learn and retain the information. i found the course very informative both in the technical and business part. This online course was amazing. I could study at my own pace. This course gave me a good understanding of the code changes for NEC 2017. The sections on Marketing were outstanding. I gained a lot of knowledge and learned ways of doing business i had not thought of before. The Course was great and useful. The material was concise and an easy read. very informative with easy links to follow with more information. would recommend to all . A well worded, well versed online course. Very organized and easy to follow. It's not difficult at all. Highly recommended, and worth the price. I learned alot from this course in more ways in my field. I LIKED THE ELECTRICAL REVIEW. Very informational and easy to navigate! Course was very informative and It gives you practical info you can use. Excellent and very helfull information. Excellent course with lots of electrical industry relevant topics and information. The course it's very helpful with the new changes on NEC. The course has a lot of information helpful for the job we do. Provide great information in a very understanding manner. More examples for as much info that was covered to help with reading comprehension would benefit retention. A thorough, informative, and convenient way to fulfill my CEU requirements and stay up to date on the changes to the Code. Good course easy to use. Course is very informative, but many of the lessons,such as Business and Legal, would be more focused for contractors, not just licensed journeyman. I do believe that anyone in the trades should also know Business and Legal, even if directly involved in the process. Very informative and well put together. This is the second time I've used AYPO for my CE. You do a great job! Thank you! Very good course. Worth my money!! Very well thought out. Nice presentation! Great code section! Class was well put together. Very informative. This was a great course. The material was presented in a concise manner. Easy to understand. THIS IS A GREAT COURSE AND I REALLY LEARNED A LOT. Exceptional course, it helped reinforce knowledge already obtained and taught me many new things. Fast and easy. Will recommend! This format was perfect for my incredibly busy schedule. Great course, easy to use and re log in after leaving. The course was easy, and easy to understand. I will definitely use AYPO next time. Very informative and easy to follow at your own pace. the course was good 5 star but this questionare wouldn't allow me to input it. I feel like i didnt really learn anything. Maybe it was just a review yo remind us about the codes. But i do like the 2nd half. No this course is great. Very thorough explanation of answers. this course was very informative and helpful,i learned a lot and was refreshed from the content of the course. Great Course just wish the videos were a little less "Cheesy"
It was good. Would like more code review. Mayby not just changes but code that is pertanent. Not a bad course, I'd be nice to review new electrical technology as well. Well constructed. Great info and questions. Easy to use. A little boring. A very descriptive and informative course easy to follow along. good course. too much repedative information. The course was very informing & easy to navigate through , you guys did a did a great job with this course & I’ll tell co workers . It is inconvenient having to wait while a section times out before you can move on to the next section to review a question. I also thought it wasn't really great that you had to take sections in your selected order. Grouping the code together seemed ok, but marketing/sales, NFPA 70E, safety,contracts and others should be allowed to taken in any order I prefer. This is the second time I have used AYOP. It was one choice of of five offerings that I considered. I would give the code changes section 5 stars. The second portion of the course covering business practices was interesting reading but the scoring was different than the NEC portion and a couple of the questions had poorly worded answers. My guess is that this was done to prevent folks from just quickly skipping to the test questions without reviewing the msterial. 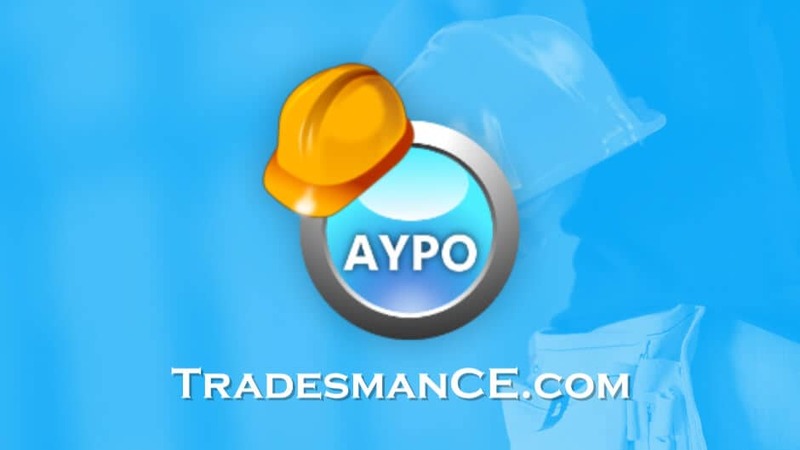 I would use AYOP again and recommend it because of the informational value and the price point. I found the courses relevant and engaging. Always learn a lot from these courses some sections are a lot of information to retain. Never the less informative. Cut the down he sales and marketing section this is irrelevant for electrical training. If I need marketing and or sales support its up to my business to get this. Otherwise good course, thank you. This course was very educational. This a great way to review my 32 continued education. The first portion of this course considering changes to the code was very good, and the first two lessons of the second section as well, but I’m not quite sure what the hell risk management and sales and marketing and contract law has to do with electricalrecertification!!!!!!! If I were looking to get my C10 license, then that portion makes sense otherwise in my opinion it doesn’t belong on an electrical recirtification course. It created a lot of undue stress on me about subjects I had no prior knowledge of nor interest in. I will most likely not use this course again in three years for that reason!!!! The course was great but had Tech. problems like getting in to my courses. The second section of material after the code portion (Industry Related), seemed like it doesn't fit. It is not appropriate unless you are starting and running your own business. You should consider changing that portion of the curriculum. The videos were difficult to use because you could not stop them and review. You had to listen to the whole video again. I did not understand why Marketing and Business Contracts were included in this course. BIG waste of time. There was at was at least 3 times during the course where it did not hold my spot after logging out. Also too much information between questions. I thought it could be broken up better. Text boxes for summary of code changes are cut off so that key parts are missing. About half of the course was not relevant to the Electrical Code. Much of the filler material in this course is not what I consider to be a good source of continuing education for a Journeyman Electrician. I am skeptical about about taking another online course after taking this course. As a plain old journeyman electrician, I felt that too much of the course seemed aimed at contractors. Also, while some of the some of the code changes covered were important, others appeared to be very slight changes in language, or what page in the NEC a rule was printed on, which would have zero effect on performance of my job. The NEC review was fine but the legal part of this course was incredibly long, boring and of no interest to someone not starting their own company. All of this legal info is covered when studying for a contractors licence anyway. You should offer courses that review/teach things relevant to a working electrician. Such as bonding/grounding, VFD's, motor controls, low voltage systems, etc. state certification is only if you are an employee of a contractor, so all of the business topics are a waste of time that could be better spent on actual technical info about the trade or more depth into code changes. I also hold a contractors lic. this course wasted at least 16hrs of my time.